My name is Gladiator. Father to a murdered son, husband to a murdered wife. And in this life, or the next, I will have my vengeance. In its day, the Roman Empire was the most powerful and influential political institution in all of European history, with Rome forming the social and economic hub of the Mediterranean world and its influence stretching out across the continent to include the territories now known as the Middle East, Britain, the Balkans, and Romania. Founded in 27 BC, when Gaius Octavius was proclaimed Augustus ('exalted one') following the dissolution of the Roman Republic after years of civil war and internal upheaval, the monarchy brought political stability back to the Roman state, and continued to flourish for almost half a millennium. In that time, the Roman Empire unwittingly laid the foundation for Western society, as it spread the Latin language across Europe, as well as its systems of law, commerce, and government. And given the rich cultural mosaic that formed its subjects, the age of the Roman Empire also saw the proliferation of Greek culture, Christian religion, Judaism, and science. The first signs of trouble in the Empire occurred in 180 AD, when Commodus was crowned emperor, which signaled an end to the Empire's 'golden era'. The remaining three centuries of the Roman Empire were filled with civil war, political instability, and anarchy as Rome's influence gradually waned, as a succession of military-based leaders tried their hand at administering its 60 million subjects. Though Diocletian was able to restore some of the stability and prosperity to the Roman Empire in the Third Century, some of his reforms ultimately led to the partition of the Empire into western and eastern portions in the Fourth Century. The age of the Roman Empire ultimately came to an end in 476 AD, when the Western Empire succumbed to invading Germanic tribes. Though the Roman state continued to exist in a recognizable form in the Eastern Empire, which was based in Constantinople, its political influence over the rest of Europe had come to an end. Despite its downfall, the infrastructure that the Empire had laid down continued to exist, albeit in an altered form. During the Middle Ages, the cultural influences of the Roman Empire continued to be passed down from one generation to the next. Christianity and the Roman paradigms of law and government prevailed, as did the Latin language, though it gradually evolved into regional tongues such as French and Spanish. The legacy of the Roman Empire was also seen during the Renaissance of the Fifteen Century, when Greco-Roman civilization was rediscovered and greatly influenced the art, architecture, law, language, and the literature of the day. "Gladiator", the latest historical epic from director Ridley Scott ("Blade Runner"), takes place between the eras that saw the rise of the Roman Empire and its gradual decline. Though the story is largely fictional, "Gladiator" uses actual historical figures and tells its story in the context of the events of the day. Scholarly issues aside, this is the kind of film that defines the term 'blockbuster'-- filled with spectacle and action, and telling a story of epic scope and humanity, "Gladiator" is an enthralling and totally immersing production that will probably be viewed as a classic in years to come. The year is 180 AD, and General Maximus (Russell Crowe of "The Insider") is a distinguished and decorated soldier, commanding the Roman Empire's brutal war machine against the barbarian hordes of Germania. However, his title, family, and his freedom are stripped away in an instant after Commodus (Joaquin Phoenix of "8mm") usurps the throne by murdering his ailing but just father, Caesar Marcus Aurelius (Richard Harris of "Smilla's Sense of Snow"). Remaining steadfastly loyal to Marcus and unwilling to pledge his allegiance to his unlawful heir, Maximus is sentenced to death by Commodus. However, Maximus is able to escape his would-be executioners, and races home to his farm to protect his wife and son. Unfortunately, upon arrival, he is heartbroken to find that his family has been butchered and his farm razed to the ground. They said that your boy squealed like a little girl when they nailed him to the cross... and that your wife moaned like a whore... as they ravaged her... again and again. Not long after, he is captured by slave-traders and befriended by fellow prisoner Juba (Djimon Hounsou of "Amistad"). The two men are then sold to Proximo (Oliver Reed, who passed away not long after production wrapped up), a man who manages and trains gladiators. Back in Rome, the paranoid Commodus is gradually tightening his grip on the reins of power, which includes dissolving the Senate and killing his political rivals. 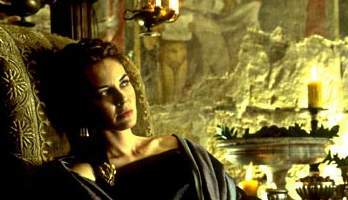 However, a few in the echelons of power are still able to undermine Commodus' dictatorship, including Senator Gracchus (Derek Jacobi, seen recently in Kenneth Branaugh's "Hamlet") and Commodus' own sister, Lucilla (Connie Nielsen of "Mission to Mars"). The beating heart of Rome is not the marble of the Senate, it's the sand of the Coliseum. Today I saw a gladiator who became powerful than the emperor of Rome himself! From its opening moments detailing the bloody carnage of a battle between the well-equipped Roman army and the Germanian hordes (no doubt inspired in look and feel by "Saving Private Ryan") to the sumptuous splendor of ancient Rome at the height of the Empire, the visuals of "Gladiator" are simply breathtaking. Blending an eye for detail in production design, along with top-notch computer-generated effects, Scott brings the long-dead civilization back to life like no other film has done before, including the preeminent representatives of the genre, such as "Ben Hur" and "Spartacus". It's not surprising where much of the budget went-- allegedly, $1 million was spent on building a giant replica of the Coliseum, alone. 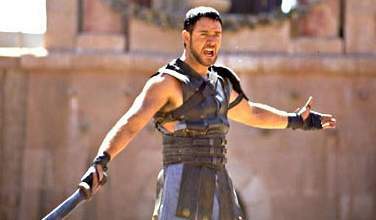 But aside from the visceral thrills, "Gladiator" also delivers on the narrative front too. This is your classic story of a heroic figure vanquishing evil against impossible odds-- it worked for "Star Wars" and it works for "Gladiator". Though the film runs at a long 2&1/2 hours, the pacing remains brisk as the story easily traverses one emotional beat to the next, thanks to some well-written characters that are as awe-inspiring as the scenery. Though many will remember the film for its violent and edge-of-your-seat gladiator battles, there is a lot of humanity found within this picture, which builds up nicely to the film's emotionally satisfying climax. The film also resonates with some contemporary sensibility, as the gladiatorial games are seen as a perverse reflection of our own sports hero-worshipping culture. The games are portrayed as the low-brown entertainment of the age, where the top gladiators become worshipped by the masses (as well as become sought after for sexual favors) and the coffers of their owners are lined with gold. The morality over life-and-death becomes moot in the face of decisions driving the business-- a situation not too different from the one presented in last year's football drama "Any Given Sunday". If you would have been born a man, what a Caesar you would have made. As the film's titular gladiator, Crowe carries the story, both with his impassioned performance and commanding screen presence-- as he was able to embody the nervous mannerisms of whistleblower Jeffrey Wigand in "The Insider", Crowe is able to project the self-assuredness, leadership, and burning rage that dominate his character. 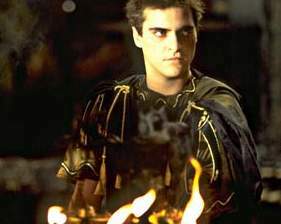 Phoenix is sufficiently malevolent and erratic as chief villain Commodus, though his prissy foaming at the mouth does go over-the-top on occasion. Nielsen redeems herself for "Mission to Mars" with her stunning portrayal of Lucilla, emanating both the poise and valor of her character, while supporting players Hounsou, Reed, and Jacobi acquit themselves nicely with their small but important roles. 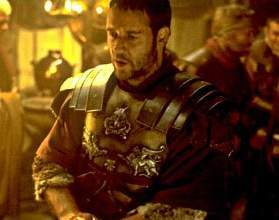 "Gladiator" is as exhilarating and memorable as blockbusters come. Ridley Scott has just about created a perfect film-- nary a fault can be found in the writing, performances, or the lensing. For those moviegoers who have been waiting for an excuse to pay full admission into the local megaplex, "Gladiator" is the ticket. Let the games begin! Images courtesy of Dreamworks SKG. All rights reserved.